Reflecting their long and loving partnership, Joanna Green and Art Godin present a delightfully diverse array of songs in a rich and elegant vocal blend. @ A House Concert Near YOU! 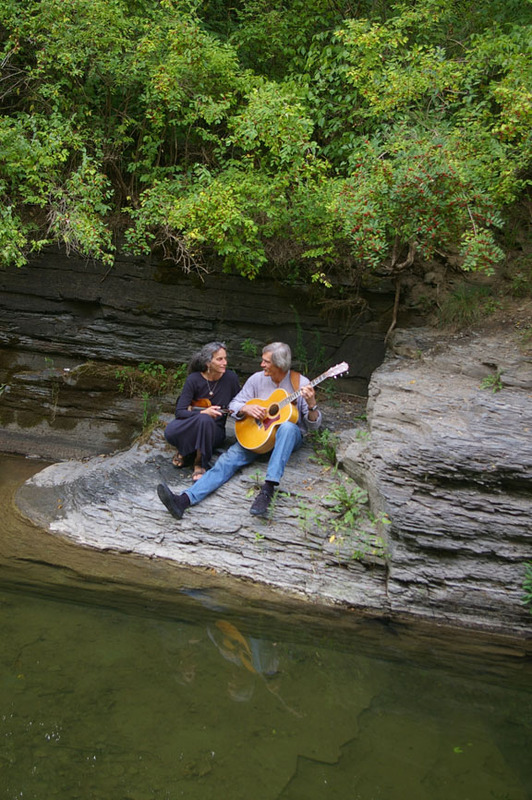 Join us for an evening of intimate songs and reflections on our 40 years together. We are currently booking House Concerts and Listening Rooms for 2019. Please contact us to discuss scheduling a concert in your community. Hello and thank you for checking us out! We are a husband/wife musical team based in Enfield, NY. That's right outside of Ithaca, in the heart of the Finger Lakes region. Our repertoire is eclectic - basically it's a collection of songs that we either wrote ourselves or that we just really connect with, in a mix of jazz, swing, latin, folk, blues, country, and Irish flavors. Our arrangements feature intricate vocal harmonies and the interplay of guitar, vibraphone, violin, percussion, and the occasional kazoo. If you've been in the Ithaca area as long as we have, you might remember some of our earlier musical projects including The B-Side with Dave Davies and Molly MacMillan, Lorelei with Patti Witten and Jody Kessler, Walt Amy and the Hepcats, The Shuffletones, and others. We're also currently performing as part of the vintage/gypsy swing band Zingology. It has been quite a while since we performed regularly, but now that we're both retired - and loving it - we're committed to finally fulfilling our musical dreams. We hope you'll enjoy our music.